The controller is the intelligent upstream starting point of each and every node. Up to 128 nodes can be used in the system. All of these are supplied locally. Each controller is able to manage 64 directly and 250 with the bus extension. This results in up to 2000 digital or 1000 analogue I/Os per node. Please note the maximum I/O consumption of 1700mA which the contoller is able to provide. 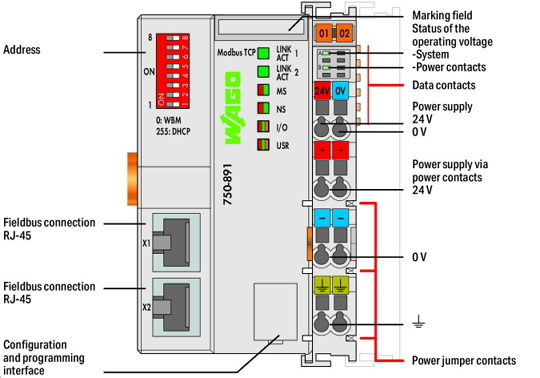 The WAGO 750-881 is used as basic controller and works with the special APS firmware. 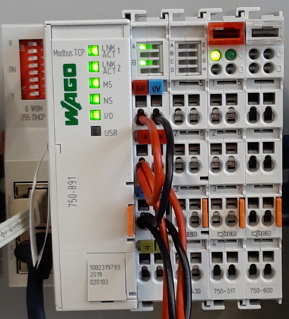 The node can be connected to the WAGO I/O module of the 750 series. This provides a cost-effective range of inputs and outputs in all possible voltage variants. The nodes are connected via a network cable (min. Cat. 5). 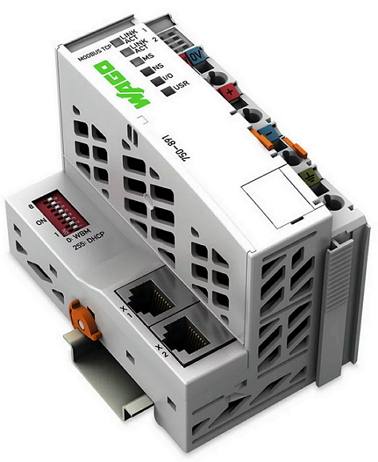 The fieldbus controller provides two ethernet interfaces with a switch. This enables a direct connection form node to node or programming access directly on the node. The standard setting of the IP-address DIP-Switch is DCHP.